Twin Spin is an awesome online Slot that brings all the very best elements of old-school vintage Slots directly to your screen. Thought you needed to hit up the fruit machines or travel back in time to a world of retro one-armed bandits to get that pure Slots experience? Think again – Twin Spin is all that and more, spicing up this classic theme with some fantastic, slick and modern graphics. Bringing together elements of both old-school, bars-and-bells style Slots and of neon-shining next-generation video Slots, the Twin Spin Slot machine is an uber-popular game loved by players of all backgrounds and bankrolls. Sign up to play here at PokerStars Casino or continue reading to learn more about Twin Spin, its exclusive features, and all the innovations that make this one of the most exciting Slots on our website. Twin Spin is a five-reel Slot boasting a cool 243 Ways to Win. At first glance, this game looks like it could be just another Slot. The symbols are full of familiar symbols such as diamonds, cherries and sevens, and it seems that the most bells and whistles it boasts is the ability to change bet levels and coin values – with 10 bet levels and six coin values there is a stake to suit all players. So far, so standard – but don't let the stripped-down, simplistic appearance of this game trick you! It will only take a few spins for you to realise that this game is jam-packed full of surprise features. A big part of Twin Spin’s appeal is the minimalist and retro nature of its gameplay. If you're mad for modern bonus features and complicated mini-games then you will have to look elsewhere for those – but Twin Spin should still appeal to you. Remember what we said earlier: don't let the game deceive you! Always aiming to be innovators in the world of online Slots, with this game NetEnt introduced a feature named Twin Reels: an always-on feature that makes the game massively exciting. So, what does the Twin Reels feature do? Exactly what it says on the tin. Every single time you spin the reels, two out of the five reels of the game are coupled together and display identical symbols. You don't need to be a Slots whizz to work out that this increases your chances of hitting a winning combination. Good, right? It does not stop there! Every now and then, at random, the Twin Reels expand further: they become triplet, quadruplet, or even quintuplet reels – further increasing your chances to hit a premium winning combination. 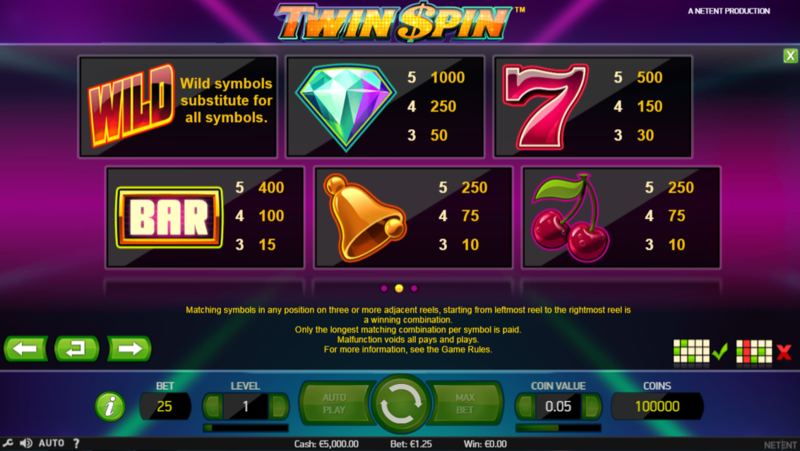 The Twin Spin online Slot does not feature any scatter symbols, nor any other way to trigger the rounds of free games that are so common in Slots today. However, it does include a wild symbol that can substitute for all the other ones to form winning combinations. The Twin Reels feature more than makes up for the absence of any big bonus features, anyway! With 243 Ways to Win when playing the Twin Spin Slot, the value of your win is of course directly proportional to the bet level and coin value selected. In absolute terms, the biggest win comes from landing five diamonds from left-to-right, giving you a tasty 1,000-coin prize. It's rare, but with the Twin Reels feature in full force there's always hope! 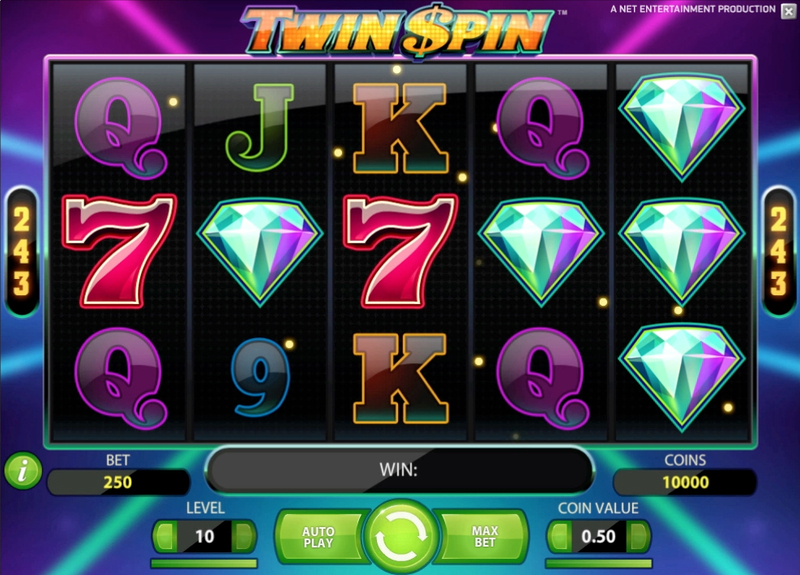 The Twin Spin Slot machine has a Return to Player (RTP) of 96.55%. Who Should Play The Twin Spin Slot Machine? 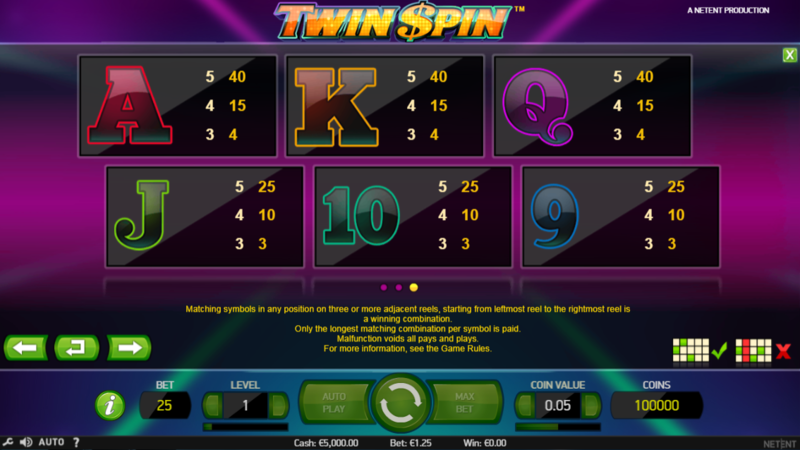 Really, everybody who loves playing online Slots should give a game like Twin Spin a… well, spin! However, it's pretty obvious that this game will appeal specifically to one category of Slots players. This might not be the best title for those players who love state-of-the-art, feature-filled video Slots like Castle Builder (where one needs to collect items to move through the game and unlock different achievements), but it's almost literally designed for for those who enjoy the fun and excitement of classic Slots. If you are up for some good old-fashioned Slots fun, make sure you give this game a shot and see where the Twin Reels take you!